South China should focus more on its most pressing task - upgrading its economy to one based on high-tech industries rather than labor-intensive manufacturing - the European Union Chamber of Commerce in China (EUCCC) said on Thursday. The EUCCC said South China is facing competition from domestic and overseas regions in attracting investment, according to a summary of the South China Position Paper sent to the Global Times via e-mail. South China includes Guangdong and Hainan provinces, the Guangxi Zhuang Autonomous Region, the Hong Kong Special Administrative Region and the Macao Special Administrative Region. Guangdong Province, as one of China's most populous and richest provinces, received particularly close attention in the EUCCC paper. The pressure to remain competitive is greater than before, the paper said, pointing to a recent survey which showed that increasing labor costs are likely to force more than one-third of manufacturers in the Pearl River Delta (PRD) to move to cheaper places in Southeast Asia, at a time when the PRD is experiencing its slowest growth in 25 years. In addition to overseas competitors, Guangdong Province is starting to be overshadowed by East China's Jiangsu Province in terms of fixed-assets investments, influx of foreign funds and the number of Fortune 500 companies located locally, according to the paper. Guangdong needs to reinvent itself in order to face up to new challenges and make the transition away from being part of the "world's factory" to being an economy based on smart manufacturing, Alberto Vettoretti, chairman of the European Chamber South China Chapter, was quoted as saying in the paper. Guangdong has started developing new sectors such as industrial robots, Peng Peng, a senior researcher at the Guangzhou Academy of Social Sciences, told the Global Times on Thursday. 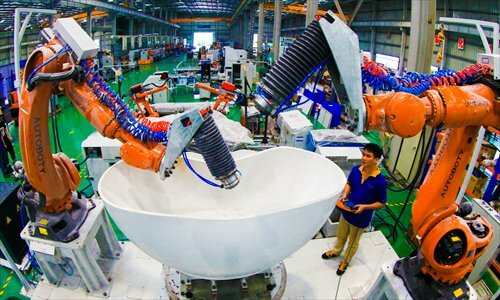 Dongguan, a city in Guangdong Province, is preparing to replace a large number of staff with robots, and Guangzhou, capital of the province, is preparing to replace 60 percent of its existing manufacturing facilities with smart equipment, Peng said, noting that local enterprises and government bodies all support the wider use of industrial robots. Moreover, new-energy vehicles and Internet-related business are being supported in Guangdong, and they can also contribute to upgrading from traditional industries, according to Peng. With more efforts in design, research and development, factories in Guangdong can progress beyond being original equipment manufacturers for other companies' products, Guo Wanda, vice president of the Shenzhen-based China Development Institute, told the Global Times. However, one major obstacle to boosting innovation in some cities such as Dongguan is a lack of sufficiently qualified staff, Guo said. The EUCCC said in its paper that South China should lower the barriers for migrant workers and foreigners to enter the region, and improve overall labor market conditions. "Guangdong is no longer the best choice for top talent," Guo said, noting that it is hard for outsiders to integrate themselves into the city due to the hukou (household registration) system and high property prices. "Investors always ask for lower labor entry thresholds but local governments have to manage the population input to maintain social order," Peng said. Another choice for investors who need high-quality labor is the Guangdong Free Trade Zone (GFTZ), which was approved in April and will offer other conveniences to investors, including eased market access, lower taxes and currency exchange services, Peng said. The GFTZ will also help with integrating South China's manufacturing belt with Hong Kong's financial infrastructure and major export markets, Vettoretti said in the paper.